I've spent years creating character sheets, covering dozens of classes, archetypes, mythic paths, maps, GM tools, strange options like lycanthropes and intelligent weapons, and more. Each character sheet is unique to your character. But there's still a lot more for me to do, not least the new edition of Pathfinder. What reward will I get for my patronage? Everything I create for this project has always been completely free for everybody, and it always will be. Patrons will get early access to work in progress, including work on Pathfinder Second Edition, but only until I think the work is good enough for release; and the work all appears on the project's GitHub repository, it isn't truly hidden. Why is this charged per month rather than per page or per class? Progress on this project is subjective, since each person will care more about some classes than others. If you pledged a value per page and I dropped a sudden 30-page update on you without warning it might be seen as unfair - especially if none of those pages are ones you care about. Will you be making character sheets for other games? I'm currently working on character sheets for Pathfinder Second Edition. If this campaign is implausibly successful it'll enable me to start working on character sheets for other editions. Otherwise, no. The work to do for just the games I already support is plenty. I am not working on D&D 5th edition. Will you be making it so I can fill these in on a computer? No. As a programmer and technophile I appreciate the value of getting away from a screen and spending time with human beings, and I firmly believe in the power of printed, written character sheets in helping people do that. Also it would be way too much work. Is there anything else I could do to support the project instead of money? 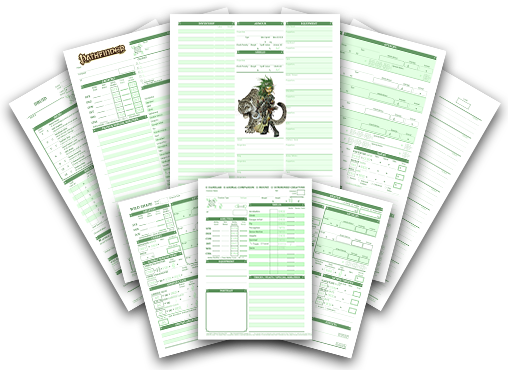 Any player who loves using these character sheets. Your whole gaming group love using these character sheets. D&D 5th edition is the biggest roleplaying game out there, and I think it would benefit from the Dyslexic approach. Adding 5th edition and doing it justice would be a massive project. I'd need to commit a serious amount of time to do it without neglecting the existing games. As always, everything I create as part of this will be free and open source so everyone benefits.